Don't own a 3D printer? No worries! 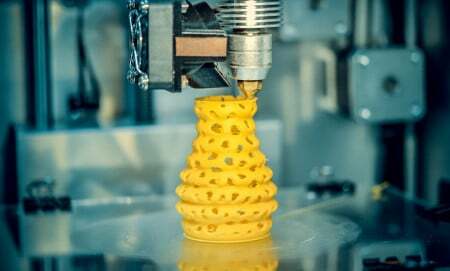 These companies offer 3D printing services to help you bring ideas to life. Desktop 3D printing is an incredibly useful technology. It can be used to prototype parts for in-development products or it can even be used as part of a manufacturing process. It is useful for Maker projects of all sorts. This article discusses 3D printing services provided by 3D Hubs and Protolabs, and their unique benefits, features, and drawbacks. Both companies offer end-to-end manufacturing services from 3D printed prototyping to production. 3D Hubs is one of the world's most popular 3D printing services among Makers and professionals alike. It is also the largest 3D printing service, geographically speaking, with many hundreds of printers in operation around the world. 3D Hubs' services have evolved over time, changing considerably since its founding in 2013 as it has adapted to changes in the 3D printing industry. For that reason, many articles about the service describe a business model that no longer exists. When the service started, 3D Hubs was a platform where 3D printer operators could make money on the side by printing parts for other people. 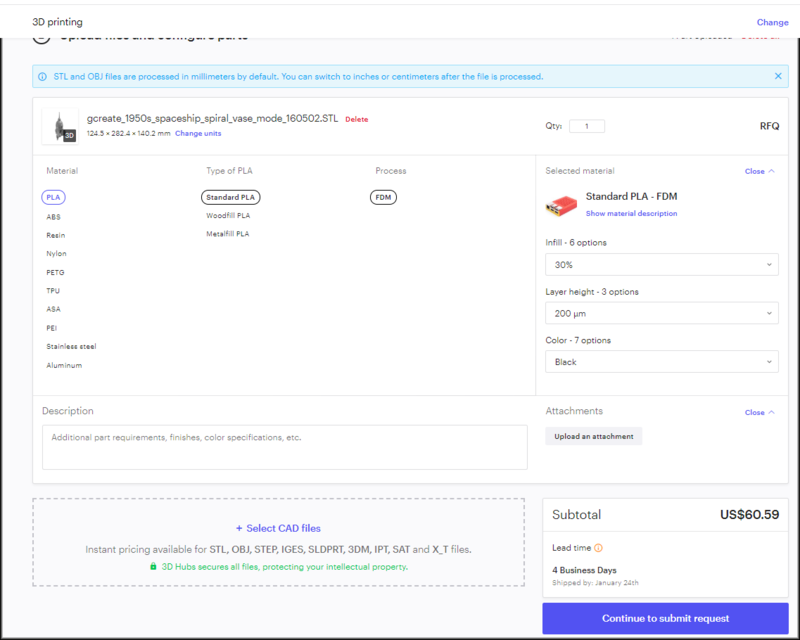 When you, as a customer, ordered a part from 3D Hubs, you could see a list of 3D printer operators nearby, order your part, and in some cases, pick up the part directly from the local Maker who printed it. 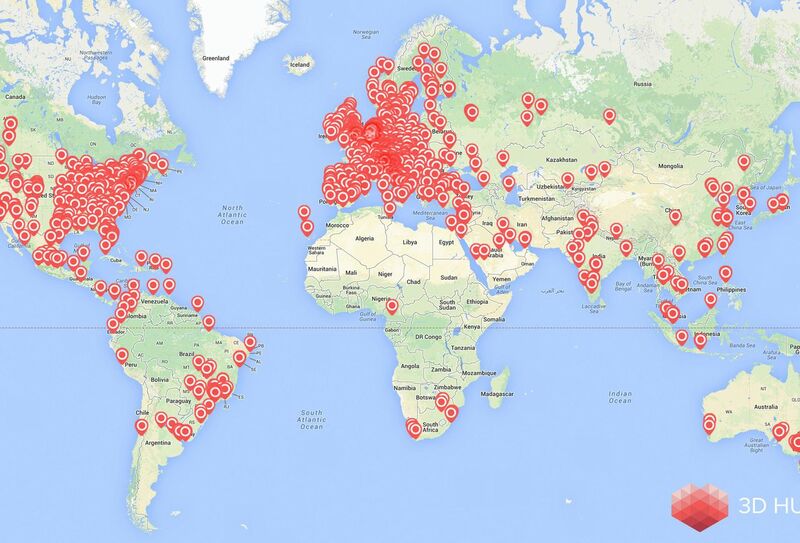 When 3D Hubs first launched, it offered a network of 3D printers around the world. When you placed an order, you selected a nearby Hub to print your parts. The change was gradual, but today 3D Hubs uses a very different model. 3D Hubs essentially closed its doors to members of the community opening Hubs and instead partnered with several hundred of its most successful Hubs to deliver a more tightly-integrated service with greater consistency in quality and service. Ordering from 3D Hubs is easy—it starts by uploading the design file you need to be printed. Upload your 3D print design files. 3D Hubs uses an automated tool to check the design for potential issues that would affect the quality of the printed part. This is a useful feature for helping to make certain your print will turn out as expected. Assuming there are no issues with your design, 3D Hubs will typically generate a price for the part instantly. A price to print your design should be generated instantly. 3D Hubs does have a minimum order value of $35, in other words, a minimum dollar amount for your order. 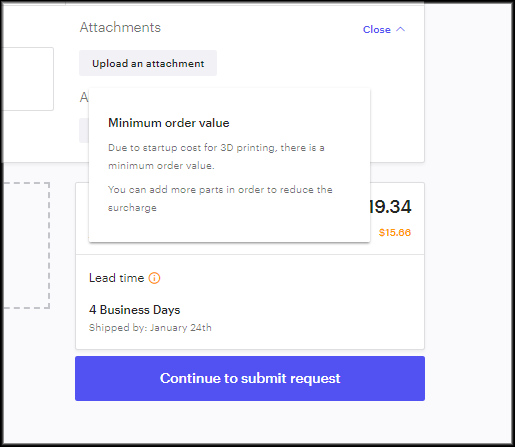 If you are printing a small or simple part costing less than $35, 3D Hubs will add a surcharge to your order to bring the price of your order up to $35. Therefore, there is not much point in ordering a single simple part from 3D Hubs. If you have a part costing less than $35, you can print multiple copies of your parts or add additional parts to your order to bring the cost above $35. 3D Hubs requires a $35 order minimum. What Project Types is 3D Hubs Useful For? 3D Hubs is a great general-purpose 3D printing service for Makers who are working on projects requiring 3D printed parts, but who do not own a 3D printer. It is also useful for Makers who might own a 3D printer who are working projects that incorporate 3D printed parts that their printers are unable to produce, like large parts or nylon parts. However, because of the minimum order value of $35 enforced by 3D Hubs, the service is not well suited to small, low-cost prints. 3D Hubs is also a useful service if you are using 3D professionally to prototype or manufacture a product. In addition to its 3D printing service, 3D Hubs also offers CNC machining and injection molding services. Therefore, if you are a designer or engineer, 3D Hubs can provide a single service to take your project all the way from proof of concept to prototyping and even full-scale manufacturing. 3D Hubs offers additional services for prototyping and full-scale manufacturing. Protolabs is a manufacturing company who offers low-volume 3D printed parts, along with injection molded, CNC machined, and sheet metal parts, for prototyping or short-run production. While most 3D printing services are beginning to focus more on professional designers, large, established companies, and technology startups, while still actively supporting Makers, hobbyists, and small teams working on one-off projects, Protolabs is focused squarely on professional clients. Protolabs offers 3D printing services to Makers but tends to focus on professional-level clients ready to take prototypes to manufacturing. The company was founded in 1999 to offer small-run injection molding. In the two decades since its founding, Protolabs has grown quickly by expanding its manufacturing capabilities. In 2009, Protolabs began offering CNC machined parts. Protolabs’ 3D printing service launched in 2014 when it acquired FineLine Prototyping, Inc. in North Carolina. Protolabs recently began offering sheet metal fabrication services. Ordering 3D printed parts from Protolabs is not quite as streamlined as 3D Hubs or Shapeways, but it is still a fairly simple process. 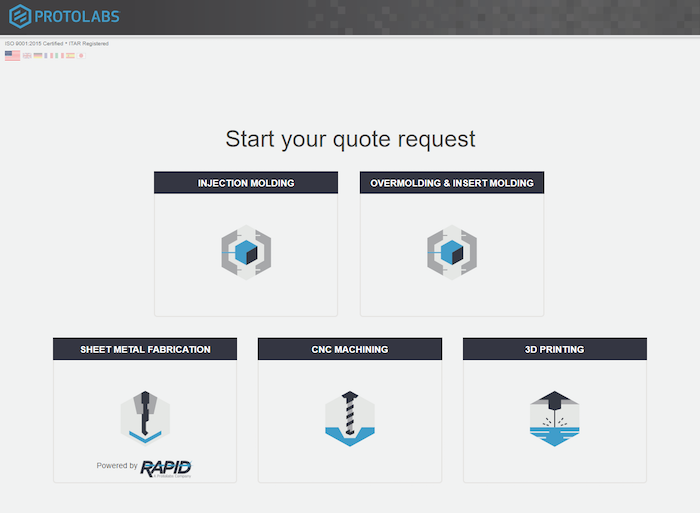 First, 3D printing is not the only manufacturing service Protolabs offers. Since it is a small-run manufacturing company, not just a 3D printing company, Protolabs also offers more conventional manufacturing processes like injection molding and sheet metal fabrication. The first step to placing your order is to choose the category of material you will be using, plastic or metal. Once you select a category, you will be presented with a list of materials from which to choose. 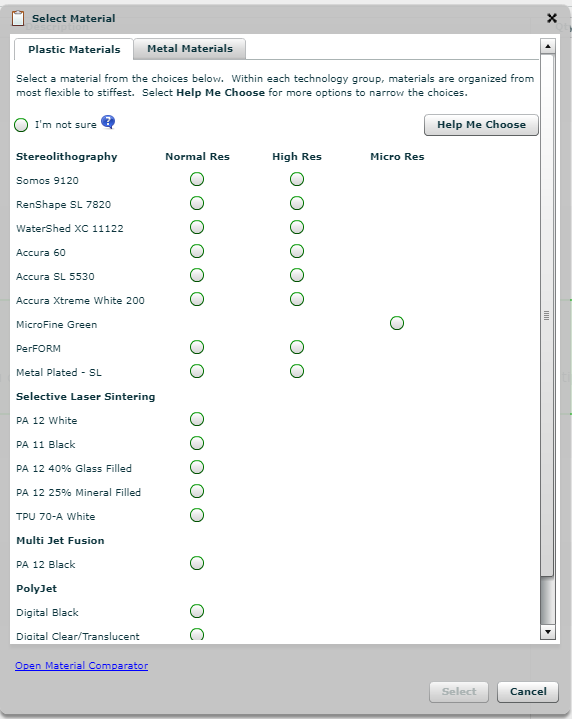 This list can be a little daunting, but Protolabs does offer a guide for selecting the best material for your project. The engineers and material experts at Protolabs can also provide guidance to help you select the best material. 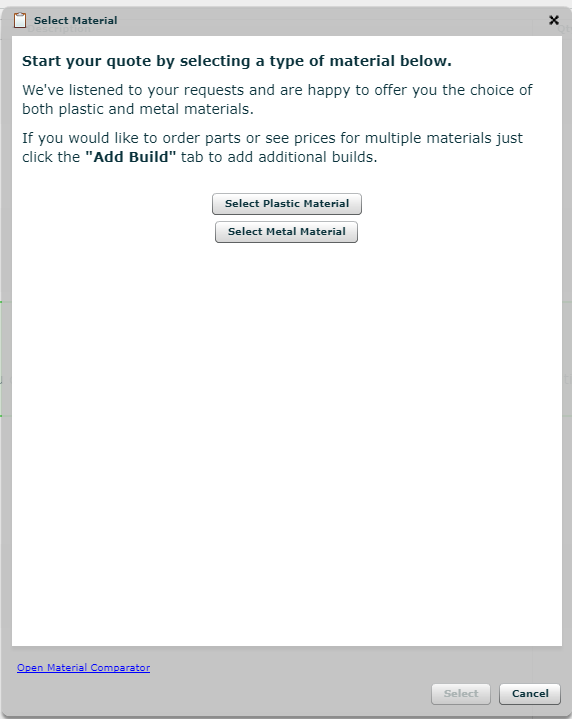 After selecting a material, you will be able to upload your 3D design file. 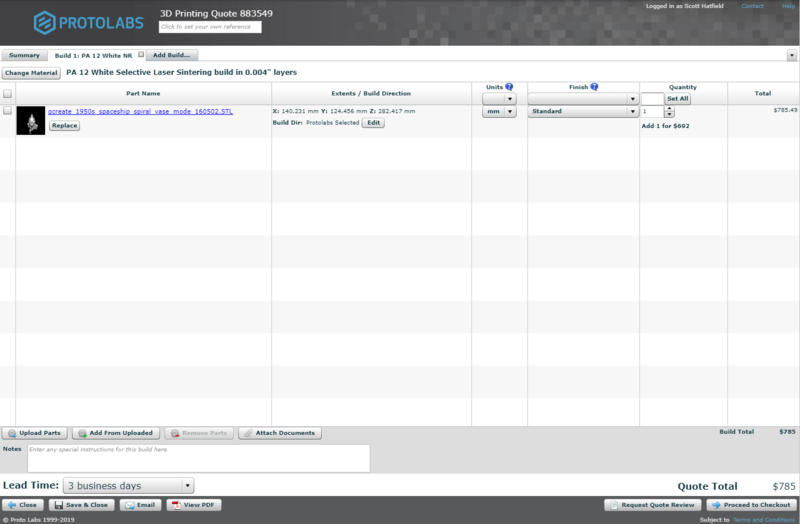 Unlike other available services, Protolabs does not use an automated design analysis tool. The service will still provide an instant quote though and if you need help checking your design, Protolabs has design experts who can help. You can place your order right away, or “Submit Quote Review” for further analysis. For What Projects is Protolabs Useful? The much more personalized design review and manufacturing process Protolabs uses makes the service a great partner if you are working on launching a consumer product. The designers and manufacturing experts at Protolabs will work with you to refine your design, maximizing its manufacturability. Plus, Protolabs provides a single service allowing you to easily transition from prototyping with 3D printing, to bulk manufacturing with injection molding.